This is College Physics Answers with Shaun Dychko. To convert units from meters per second into kilometers per hour, we need to find conversion factors that will cancel away the units we don't want, and leave us with units we do want. So we have seconds on the bottom of the fraction we're starting with and so we want, in our conversion factor, to have seconds on the top of the fraction. And we know there are 3600 seconds in every hour, and we chose hours on the bottom because the question says you have to end up with hours on the bottom of your answer. We could have done 60 seconds per minute, and all sorts of other combinations of different units of time, but we've chosen seconds over hours in order to cancel seconds here, and be left with hours for our answer. And then likewise for the length unit, we have meters on the top and so our conversion factor will have meters on the bottom. And we chose to have kilometers on the top because the question says have to have kilometers in our answer. And so we have kilometers over meters, and there's one kilometer in every 1000 meters. 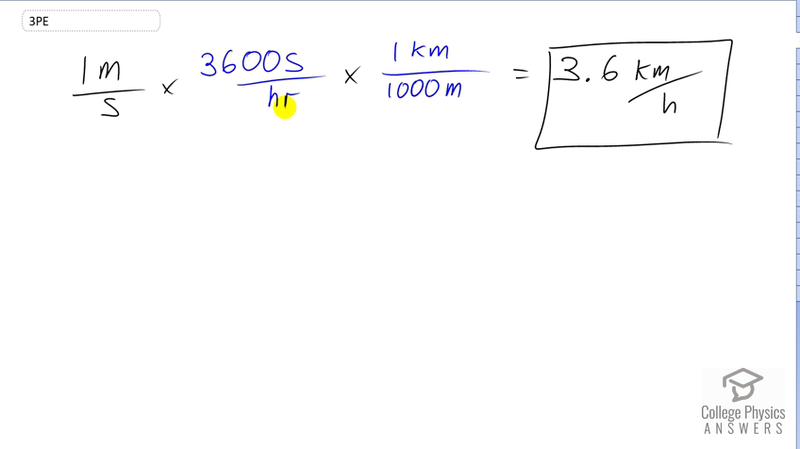 And then the arithmetic is 1 times 3600 divided by 1000, and this makes 3.6 kilometers per hour because these meters cancel and these seconds cancel leaving us with kilometers over hours.